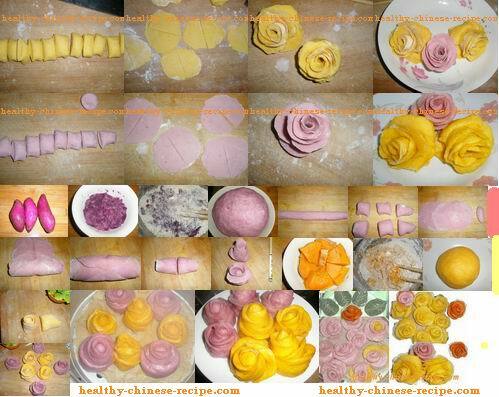 Making Rose cake, or rose dessert, snack by wheat flour, purple sweet potato, and pumpkin can be so easy and fun!. Let it become one of your Valentine's Day food. As a cooker or gourmet, you should have the ability to express many things in food. Look at these beautiful rose flowers. They are actually Chinese steamed bun. Combing purple sweet potato and pumpkin, these rose shape foods are very healthy and tasty. 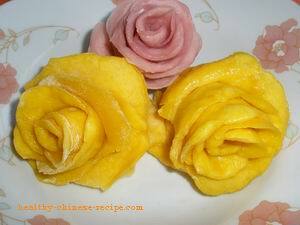 In this romantic Valentine's Day make some rose shape snacks for him/her, or yourself. It's enjoyable! 1. Wash purple sweet potatoes. 2. Steam, press into mud. 3. Mix sweet potato mud, yeast, wheat flour, condensed milk. Knead into a dough. Add some fresh milk if dry. 4. Cover. Cover. Let it rise in a warm place. About 1 hour. 5. Take 80g dough. Roll into long strip. 6. Cut into 6 same size small dough. 7. Roll and press into five thin round bun skin (rose leaves) by rolling pin. Take the rest dough in hands. Roll and twist into round long diamond shape stick (flower heart). 8. Fold the five bun skins one by one, leave a little space for each. Put the stick on the top. Press at the center by using a piece of chopstick. 9. Roll the bun skin into a roll. Roll tight. 10. Cut the roll in the middle (the pressed line). 11. Stand up a half roll. Each is a flower. Arrange the leaves to make sure it looks like a flower more. 12. For yellow color rose, make by pumpkin. Cut pumpkin into small blocks. Steam. Remove peel. Mash. The rest is the same as that of red rose(purple sweet potatoes). 1. You can add rose leaves one by one, but it's time consuming. 2. You can add different seasonings according to your taste such as sugar, milk powder, coconut powder,etc. Serving Method: Serve as a snack or dessert; Or as staple serving with soups or other dishes.